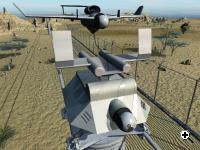 “Planum Vision”, an Israeli company specializing in security systems, has developed the TCUAV – Train Cable Unmanned Aerial Vehicle. The company claims their UAV has better surveillance capabilities due to its ability to oversee broader areas from different angles at all hours of the day. Existing overhead vision systems currently face major engineering challenges, such as short operating ranges, susceptibility to weather conditions, and various technical limitations. “Planum Vision” says the TCUAV is a cost-effective solution to these problems, since it can stay in the air for longer periods of time and can cover more ground than any existing UAV. One of the main weaknesses of most existing security and surveillance systems is the inability to survey “dead areas”, created either by topographical conditions, or by insufficient or inefficient control over surveillance assets (in simple terms: not enough “eyes” to cover too much ground) . This problem can be solved by placing additional surveillance equipment or by increasing the frequency of manned or unmanned patrols – both rather costly solutions, according to “Planum Vision”. Another significant setback in today’s surveillance systems is the fixed patrol routes. A potential enemy can learn the patrol routes and the schedule of the patrols surrounding a facility, and operate accordingly. The TCUAV system consists of an unmanned aerial vehicle (UAV) powered by electricity from cables installed on dedicated electric towers. The electricity is transmitted from the towers to the device through a wire, laid out as an aerial railway on which the vehicle moves. 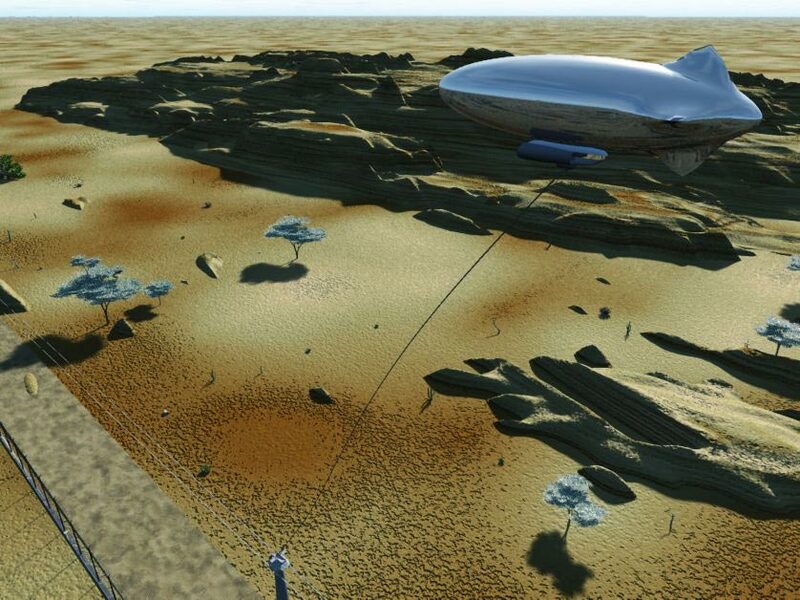 The UAV, which comes in various forms including a zeppelin, is attached to the “train” unit with a wire, so that it enjoys a constant supply of energy as it hovers over the designated path above the “train”. The UAV can be dynamically disconnected from the “train”, and continue flying autonomously or by remote control in case a hot pursuit is needed. Using sophisticated software, “Planum Vision” intends to dynamically change the route of each train and UAV unit so that potential intruders will find it more difficult to anticipate the next “patrol”. According to the company, the UAV’s dynamic viewing angle when flying several dozens of meters in the air compensates for the missing “dead areas”.. The constant supply of electric energy allows for continuous 24/7 operational use, including several backup units. “Planum Vision” told TFOT this kind of basic infrastructure, based on cables and electric towers, is trustworthy, easy to implement, and has a relatively low cost. In addition, the company claims this set-up reduces the number of mechanical failures due to the incorporation of more reliable electric motors (instead of conventional engines which require relatively frequent maintenance), and the unique uninterrupted energy supply system. The UAV systems market is expected to grow by a rate of $13.6 billion until 2014, with approximately 9,000 UAV systems expected to be acquired globally during the next decade. 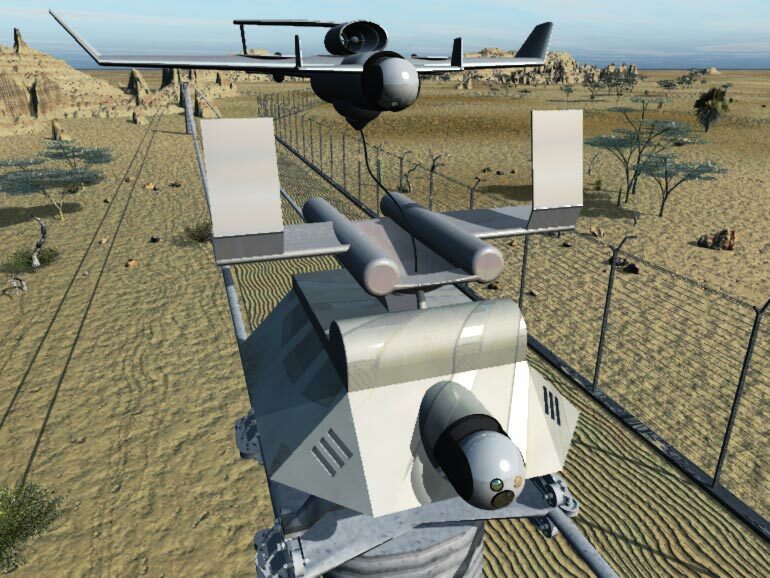 “Planum Vision” envisions a number of potential markets for its novel fixed-route overhead vision concept – both in the military and civil defense sectors. Currently, UAV’s are widely used for military purposes and the company hopes the TCUAV will prove to be a reliable and low-cost system for surveillance and scouting purposes. The TCUAV could be used across borders and along offshore barriers, roads and large-area compounds. In the civil defense market, the TCUAV could be used as an overhead vision system for the media, and could even serve as a law enforcement tool. The device also has the potential to be used for completely different tasks, such as controlling precision spraying and irrigation in agriculture or cattle herd supervision. TFOT recently covered several advanced UAVs, including a UAV to UAV Refueling concept, the MONGURD – Canister Launched UAV, and the Zephyr – a solar UAV champion. You can find more information on the TCUAV at “Planum Vision’s” official website, including a video demonstrating the UAV-train concept.